In keeping with our mission of immersive hands on sewing factory training, and supporting social initiatives in New Mexico, we’ve taken on the production of trap covers used in the capture of feral cats. For those who don’t know, TNR refers to Trap, Neuter & Release. By trapping and neutering feral cats, colonies become stable and neighborhoods are safer (in many places, cats are also vaccinated against rabies). 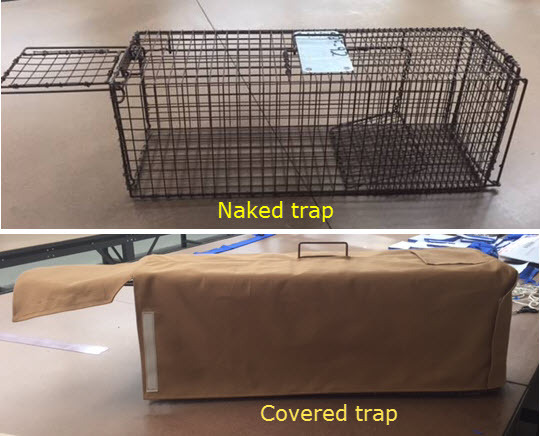 The traps require a cover to create a cave-like environment -because, as we know, all cats love cardboard boxes– that will attract the animal but also keep them calm once the trap is sprung. Keeping a feral cat calm is an imperative. When I trapped the feral cats (7!) at the factory last January, several of them injured themselves quite badly because the covers were loose towels thrown over them. That experience is how I learned of the great need for these covers. In most places in the US, volunteers take up the cause and stitch them together with old sheets but these tend to be rather see through. Other places use old towels but these are not secured either and tend to blow off, traumatizing the animal. The towels are a problem in another way in that they use a lot of resources in washing and drying. It was with this in mind that I began working with Street Cat Hub to design a better cover. I’d make a prototype and they’d test it. Finally after version 8, we got a cover that we all like. Last weekend, we cut 150 covers in the factory. Yesterday, some of our Spring Boot Camp designers showed up for pre-training and used the trap covers started sorting the cut bundles for “mass” production. We marked placement for velcro and the top pocket (needed for location notes on the animal). We also began stitching them together. Speaking of, you can get involved too. We are offering FREE industrial sewing lessons to volunteers who will sew the TNR trap covers here at the factory. 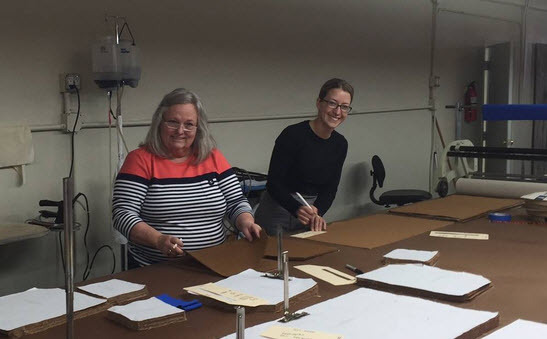 If you volunteer, you’ll learn industrial sewing methods and the use of industrial walking foot machines, among other things in our state of the art sewing factory. If you’re interested in participating, so indicate in comments or call me at 505-877-1713. Our schedule is very flexible. You can work during the week or on weekends as the factory is open nearly every day. I neglected to mention that the fabric for these covers was donated by Hup Pup, a pet product manufacturer. We have also allied with PACA to distribute the trap covers. Now all we need is you! I think this is wonderful. About 6 years ago when I got 5 ferals I fed at my old house, and one lives with me now, I got so nervous and had the traps for about a week on loan, that I made awesome trap covers so they would be OK in the house overnight, twice. They were a heavy duty twill, fitted and with velcro closures. Here’s hoping yours will be as good as mine were. I gave them to the group that lent me traps after TNR was complete. Because, why shouldn’t they have them? and yes, the cats were all calm both coming the night before, and leaving after their return to my house from Animal Humane for that last night. All thanks to the cover. Also an easier ride to Animal Humane as well. So yes, they work very well and were all washable. Hello Kathleen, I know this post is over a year old but I was wondering if this is an ongoing project that you are offering in exchange for free industrial sewing lessons or if it was just a one time thing. I have had your site bookmarked for several months in anticipation of perhaps attending one of your bootcamps. I missed the fall deadline but maybe in the spring. Apart from the bootcamps, do you offer any industrial sewing learning opportunities like the feral cat cage cover project? I will be newly unemployed and homeless (by choice) in September and I am seeking out opportunities related to my interests in sewing and sustainable clothing design. Thank you. Is there a pattern for these? We could use a few covers in Socorro.